Over the weekend, I went windsurfing with some friends at Shoreline Lake. I’d tried it once before, when I was about 14, but I never really got the hang of it. This time I fared a bit better. The lake is across the street from work, so I go running around it and the neighboring wetlands a couple times a week. I’d never been on a weekend, though, and I was surprised at how crowded it was. Even so, we were able to rent rigs and get out onto the water within 15 minutes. Ken and Peter gave me some pointers on the way to the lake, but still, I struggled for a good 45 minutes or so. It’s surprisingly difficult. The sail is big and heavy, and it takes work to haul out of the water, so that alone was a challenge. The balancing act on top of a glorified surfboard didn’t help much either. What’s worse, the wind was gusty, so the sail whipped and jerked as soon as it came out of the water. It took me a while to figure out how to handle it, especially while I was avoiding the other beginners packed along the shore. After a while, though, I built up some calluses, some reflexes, and a mental model of how the sail behaved and how to control it. Peter gave me a few tips and a nudge, and after a minute or two, I was sailing! 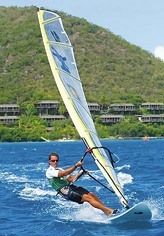 OK, I wasn’t really sailing as much as I was floating, upright, at a decent clip. Still, it was a lot of fun. I might have to go again next weekend!